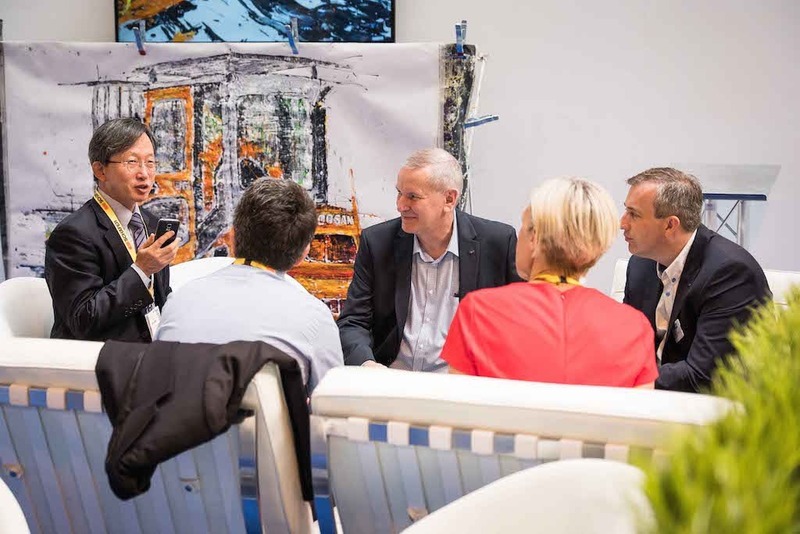 HSS editor Simon Duddy caught up with senior management from Doosan at the recent IMHX show to hear how the Korean manufacturer’s strategic emphasis is shifting towards electric trucks. Traditionally Doosan was thought of as a manufacturer of diesel engine powered forklift trucks. While this is very much an important part of the business, the electric side is growing rapidly and set to grow further. This is in part down to increasingly stringent emissions regulations on diesel engines. One of the most prominent VIPs to visit the show, Dr K.B. Park, CEO of Doosan Industrial Vehicle in Korea, explains: “As the emission requirements become more stringent it is very difficult to pinpoint which technology will be the best choice. “To meet Tier IV stage requirements was complex and costly and we did this with the G2 engine. Our focus was to develop a new combustion chamber to allow us cleaner emissions, and it was very successful. Park expects for Tier 5, every engine will need a diesel particulate filter (DPF) which will push the package price up and increase maintenance concerns. DPF needs elevated temperatures to work well, so for light-duty forklifts you need forced regeneration (running the trucks while idle), which uses fuel unproductively, adding cost. Tim Waples, CEO of Doosan Industrial Vehicle UK takes up the topic. In the UK, Doosan’s acquisition of Rushlift is not typical of the global manufacturer’s strategy but was led by the wishes of Rushlift’s management. This has led to organisational changes and considerable investment in Rushlift, which is starting to pay dividends with encouraging sales for Rushlift this year. Tim says the market was suffering from uncertainty in the aftermath of the EU Referendum, as it was unclear what it meant for the UK. Paul Watson, UK sales director at Doosan Industrial Vehicle UK sums up the importance of the recent exhibition. “IMHX 2016 was a milestone event for us. It was the first time we showed our products alongside the parts of our business acquired through Rushlift, such as fleet management and in-house finance. This IMHX has come at just the right time for us.